Why shares of this discount retailer could have more room to run. Dollar Tree (NASDAQ:DLTR) trounced the market in 2015 and is doing better than major indexes so far this year. The stock is rising as more people frequent the discount retailer's shops to help solve the challenge of balancing their tight household budgets. Yes, shares are priced at a premium to rival Dollar General (NYSE:DG) -- and there are major financial risks ahead as Dollar Tree works to integrate the $9 billion Family Dollar business with its own. But there are still a few good reasons why the stock might continue its market-thumping ways from here. First, the company needs to beat its retailing rivals on sales growth. Dollar Tree just posted its 31st straight quarter of positive comparable-store sales as comps rose by 2.1%. That improvement was roughly equal to Dollar General's 2.3% increase, but solidly above Wal-Mart's (NYSE:WMT) 1.5% uptick. It also followed a 5.3% surge in Dollar Tree's prior-year period. Dollar Tree achieved that strong two-year growth through a healthy mix of increasing customer traffic and higher average spending per customer. As CEO Bob Sasser put it in his latest earnings conference call with investors, "We're attracting new customers every day and when the customers are in the store, they're buying more." Sasser and his team aim to keep store traffic and average spending growth chugging along at a faster pace than rivals, whether they are big-box retailing giants like Wal-Mart or specialized competitors like Dollar General. 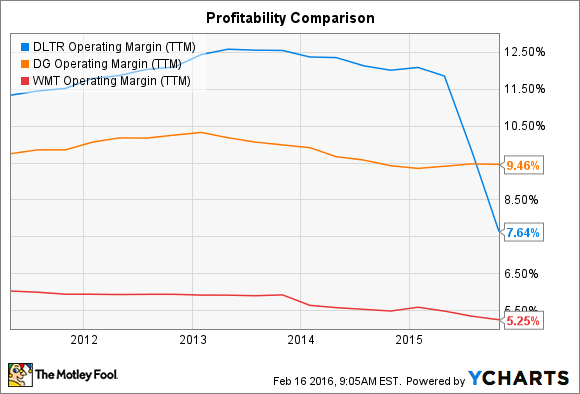 DLTR Operating Margin (TTM) data by YCharts. Yet almost all of that drop had to do with costs involved with integrating the Family Dollar business. The good news is that there are signs that profit margins will be headed higher. For one, management is making tweaks to the Family Dollar stores in order to bring their efficiency level closer to that of Dollar Tree's, and with Family Dollar's gross margin at 24% -- compared to 35% for Dollar Tree -- there's plenty of room for improvement. Second, the company aims to save $300 million in annual operating costs once the merger is complete thanks to increased leverage with suppliers and lower overhead expenses. Finally, a smooth integration with the Family Dollar business could pave the way for solid long-term gains for the business. That happy scenario is by no means a guarantee, though. After all, the transaction involves merging 13,000 retail store locations, 23 distribution centers, and 180,000 employees. In fact, it's the biggest retail merger to date, based on store count. With an integration that's this complex, it's inevitable that there will be a few expensive bumps in the road. But as of late November, executives haven't seen any issues crop up that would derail their optimistic reading on the Family Dollar merger. "There have been no surprise that will change our outlook on the strategic rational," according to Sasser. "There is only increased excitement about the opportunities that lie ahead as a larger, stronger, and more diversified organization," he said. Investors clearly share some of that excitement, since Dollar Tree is valued at 19 times expected earnings, compared to 16 times for Dollar General and Wal-Mart. For the retailer to earn that premium, it will have to navigate a massive merger while keeping sales and profit growth one step ahead of rivals.